Raman Kumar, Twenty years old boy, always wanted to be a self-reliant boy. His father’s name was Sh. Ishwar Dass Singh, who passed four years back due to illness. His mother’s name is Kailasho Devi and is a home maker. He wanted to make a difference not only in his but also in the life of his family´s too. One day at his village housing colony at Domail, Udhampur, J&K, he came to know about a Ministry of Rural Development program called Himayat, run by Don Bosco Tech at Udhampur through mobilization. 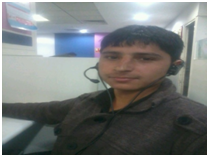 With hope in his eyes and dreams of self-reliance, he walked into the Himayat centre and got himself enrolled in the BPO associate Program. Before joining the program he was sitting ideal at home, doing nothing. He came to Don Bosco Tech with lots of expectations as he wanted to learn and then earn after the training. He belongs to a family of 3 members with only his Mother as an earning hand. Her monthly family income is only Rs. 3000/- per month which is not sufficient to feed 3 mouths. So he decided to move out of the house and get trained before he could earn for himself and his family to improve their economical status. He likes to interact with people and his interest inventory shows that he has good interpersonal skills with strong liking towards solving problems. Which he thinks fits his in BPO industry which involves lots of interaction and solving problems of the customers directly or indirectly. He is very happy to join the center and shows keen interest in the training. He likes the way induction was conducted, which covered the topics of life skills like time management, money management and grooming. He is learning with activities and improving her personality day by day. On the very first day, he learned that Himayat is the only program which can change his life and give wings to his dreams. For him now, there is no turning back, only a destination ahead.